Some rewards credit card customers pay hundreds of dollars every year just for the privilege of being a cardholder. While other borrowers opt for the more basic rewards card with a lower annual fee attached. As someone in the market for a new piece of plastic, are you leaning towards one with minimal overheads? Read our guide for the lowdown on what this card type is all about. Ready to start comparing now? Look below for our top cards. Is a low annual fee rewards card for you? You’ve probably heard the term “spending personality” before. It’s easy to see why the concept was coined. Everybody has different financial circumstances and their own lifestyle preferences. To see if your spending personality is the type that suits a low annual fee rewards card simply answer “yes” or “no” to the following q’s. Are you…. Frugal with money, but like having the option to splash out every now and then? Someone who pays credit card bills in full each month and on time? Attracted to freebies and rewards like bonus gift vouchers, cashback offers and purchase protection insurance? Not keen on a “no frills” credit card with zero added benefits? 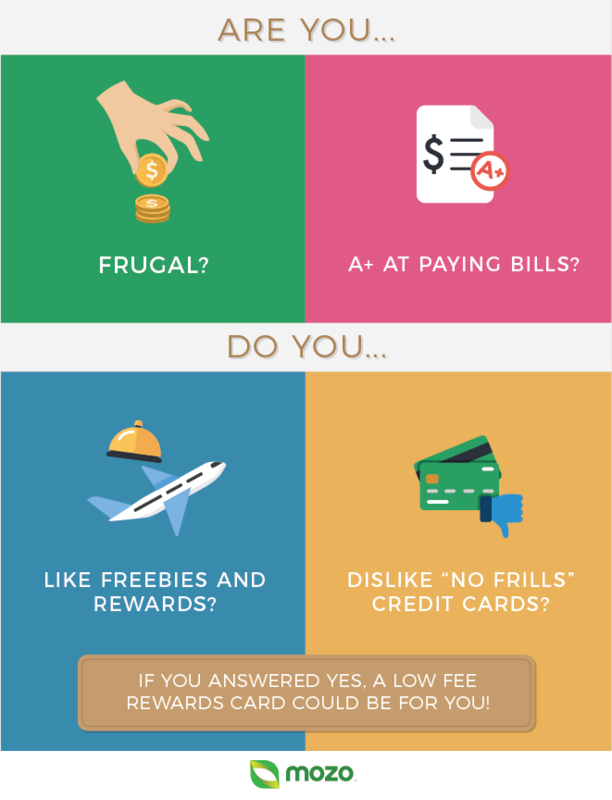 If you answered yes to most of these q’s, you’re likely the budget minded spender and potentially suitable for a low fee rewards card. Low purchase rate: As we suggested above, rewards credit cards are really designed for those who pay their bills on time and in full each month. But slip ups happen every now and again, so choosing a credit card with a low purchase rate, on top of a low annual fee can help cushion the fall. Fact: The highest interest rate among rewards cards listed on our database is a steep 22.74%! High number of interest free days: No matter how diligent you are at staying true to your billing cycle, the more interest free days you have the better. Providers generally offer between 44 and 55, so going for something at the higher end will bide you time before that interest kicks in. Appealing introductory offer: There are plenty of low annual fee cards offering incentives for new customers like gift vouchers and bonus rewards points. Just read the fine print to ensure you can fulfil the spending criteria, such as purchasing a certain amount by a set date (usually three months after the card is issued) to trigger the offer. Your preferred points program: Do you like flying with the white kangaroo or budget-friendly airline Virgin? Perhaps you rarely travel and would rather your rewards points go towards feeding your family in the form of grocery vouchers. With the abundance of rewards programs to choose from (like Qantas Frequent Flyer, Virgin Velocity and Woolworths Everyday Rewards to name a few), ensure you pick a card affiliated with a program that suits you best. High (or low) credit limit: The maximum amount you’re allowed to spend on your card comes down to how much money you want access to and what your card provider will approve you for. Some consumers are easily tempted to splurge so they opt for low credit limits, while others prefer the flexibility that comes with higher spend thresholds. If you need high credit leeway, keep in mind that some rewards cards with minimal or zero yearly fees keep limits down compared to premium cards. Less cost upfront: Annual fees are paid when rewards cards are issued, which means less money taken from your pocket at the start if you opt for a low annual fee card. Here at Mozo, generally we consider cards with annual fees under $100 as a low rewards card price point. Rewards program access: The difference between basic credit cards and rewards plastic with low yearly fees, is that with the latter you’ll earn points for shopping with the card. Some convenient features: We’re not going to lie, low annual fee rewards cards probably won’t give you VIP passes to airport lounges or free flights. But as the saying goes, you get what you pay for. In return for a small yearly fee, you could be looking at complimentary insurances, sign up incentives to gift cards. Can have low rates: Compared to platinum cards (which are known for charging the highest purchase rates in our database), some low annual fee cards come with competitive rates. Lower earn rates to build points: Points you earn for each dollar spent using your card, known as “earn rates” can be a dealbreaker if they’re too low. For instance, a low annual fee card may not be for you if you’re set on redeeming points on an interstate flight quicksmart. Few complimentary features: Freebies are fun, and low annual fee plastic providers offer few of them. So if you’re looking to get star treatment from concierge services on your next business trip, pay a higher annual fee for a different card that comes with more perks. Age. Prove that you’re 18 years or older by supplying your driver’s licence or passport number. Address. Aussie credit cardholders all have residential addresses in the country, so you may be asked to provide evidence of where you live by including your last bank account statement or energy bill. Income. Proving how much you earn can be done by uploading a copy of your last payslip in the application. Keep in mind, all low fee rewards credit cards have minimum earning requirements starting from around $40k. Credit score check approval. Remember, your credit history will be checked when you hit submit, so make sure you’re confident about it before clicking through. Ready for an introduction into the world of rewards cards? Take that first step and pay a visit to our virtual hub!